Hesham Abduljalil AlSabbagh, former spokesperson of the now-dissolved Islamic Action Society (Amal) and counselor to its Secretary-General Mohammed Ali Mahfouz, was arrested in Bahrain in April 2013. Since then, he has been disappeared, tortured, and convicted on politically-motivated charges. He currently remains in Jau Prison, where he is routinely denied access to medical care. Amal was a registered opposition party in Bahrain since 2005, and was the second largest political association. Following the March 2011 crackdown on peaceful pro-democracy protests in Bahrain, Amal’s Secretary-General, most of its board members, and more than 200 of its active members were arrested. On 4 October 2011, 14 members of the opposition society were sentenced by the National Safety Court to up to 10 years in prison. In 2012, the Ministry of Justice filed a lawsuit to dissolve the Islamic Action Society for alleged “grave breaches of the provisions of Bahrain’s constitution and laws,” and the Bahraini Government dissolved the society that same year. On 26 April 2013, in Sanabis village, while Hesham was asleep at his apartment, officers in plain clothing and wearing masks raided his home. They surrounded the area with police cars and minibuses from the National Security Agency (NSA), searched his apartment, and seized Hesham’s property. This was all conducted without a warrant. Hesham was disappeared and held incommunicado for a month and a half. He was initially detained at the Criminal Investigations Directorate (CID), then after two weeks he was transferred to Dry Dock Detention Center. During a period of five months he was summoned for interrogation by the CID and by the Office of the Public Prosecution (OPP), without the presence of his lawyer, to interrogate him about his activism and his work at Amal. Hesham stated that he was only calling for reform. During these interrogations Hesham was still unaware of the charges against him. During interrogation at the CID, officers blindfolded Hesham, tortured him by beating him and kicking him on his face, forced him to stand for hours, and deprived him of sleep in order to force a confession, which was used against him during the trial. Due to the beatings, Hesham sustained fractures in his jaw on both sides. Following his torture, Hesham asked to have a doctor examine his wounds. However, he was not seen by a doctor until December 2013, eight months after his interrogation and subsequent torture. Because of the delay in being allowed to see a doctor, all traces of torture had disappeared except for his jaw, which required multiple surgeries to enable him to eat normally. These surgeries were ultimately unsuccessful in providing him relief, as he did not receive any medical treatment after the surgery, he was not given the adequate medication, and he was not given appropriate meals considering his inability to chew following such surgery. On 29 September 2013, the Fourth High Criminal Court sentenced Hesham to 15 years’ imprisonment on the charge of joining the “February 14 Coalition” (an informal and mostly online group that the Bahraini Government has designated a terrorist organization). On 17 February 2014, his sentence was upheld on appeal. In August 2018, Hesham was supposed to undergo an additional surgery for his jaw, but when he was transferred to the hospital there were no beds available for him to be admitted and he was returned to prison. The prison administration failed to follow up or reschedule and did not take him back for further appointments. On Thursday, 6 December 2018, Hesham began a hunger strike to protest the denial of medical treatment, including preventing him from going to his scheduled appointments with the doctor and not changing his meals to help alleviate his jaw pain. On 11 December 2018, the prison administration promised to meet his demands and they asked him to break the strike, which he ultimately did. However, the prison administration failed to follow through with their promises. Hesham is currently being held in Jau Prison, with a group of political prisoners called “February 14 Leaders,” where they are subjected to widespread harassment and collective punishment. On 27 December 2018, security forces raided their building. Hesham and the other inmates were moved out of their wards, searched thoroughly by police dogs, and the prisoners’ personal items were seized. The prison authorities provided no reason for these actions, and the prisoners reported that these raids occur occasionally as a form of harassment. In addition, the officers also seized Hesham’s medicines, shortly after being provided to him in response to his hunger strike. Bahrain’s torture, ill treatment, and unfair trial of Hesham are in violation of his fundamental human rights and Bahrain’s international and domestic legal obligations. In this case, as in others, the Bahraini Government did not fulfill its obligations under the international treaties to which it is party, including the International Covenant on Civil and Political Rights (ICCPR), the Convention Against Torture and Other Cruel, Inhuman and Degrading Treatment or Punishment (CAT), and the International Covenant on Economic, Social and Cultural Rights (ICESCR). 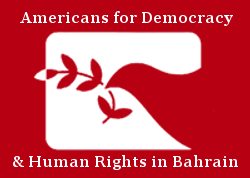 In light of this record, Americans for Democracy & Human Rights in Bahrain (ADHRB) calls for Hesham’s release with redress for past suffering and, if serious criminal charges can be sustained against him, for a fair trial conducted under universally agreed juridical standards and open to international monitoring and evaluation.